When was the last time you organised an inspection of your home’s electrical wiring? Electricity is dangerous, full stop. And electrical inspections are a proactive way of protecting your home and property. Regularly scheduled electrical check-ups help identify and immediately fix current or potential electrical hazards. Whether you’ve simply forgotten to schedule one or you’re moving into a new house soon, we recommend scheduling an inspection ASAP! Doing so can protect you from some of these common (and potentially dangerous) home electrical problems! Have you noticed a persistent burning smell near your electrical outlets and switches? Do you often see your lights flicker or dim every time you use them? If so, call an emergency electrician, ASAP. Each of these are common signs that you have faulty electrical wiring, with the potential to lead to a house fire. Don’t just take our word for it either – according to the CFA, 30% of house fires in Victoria are electrical in nature. Faulty electrical wirings can be caused by many things: damaged wiring, poor workmanship, lack of safety features like Ground Fault Circuit Interrupters (GFCIs – more on those later)… all of these are potential dangers, and should be evaluated by an emergency electrician. Older homes in particular weren’t designed with modern lifestyles in mind. Back then, we had fewer appliances and used less power. Many have tried to overcome these limitations by jerry-rigging solutions using extension cords, power boards and the like. All of this has the effect of crowding your wiring. This can lead to serious electrical hazards: crowded wiring can lead to an overloaded circuit, pumped up with more devices than it can handle! This often leads to electrical fires – the best way to resolve this is to call an emergency electrician to bring your crowded old wires into the 21st century. Fire isn’t the only common electrical risk around the house. If your home has exposed wires, you might be putting yourself at risk of electrocution too! Electrical cords are built tough. However, over time, the protective jacket can suffer damage or wear out, exposing the wiring within. Contact with these can cause electric shock and even fire when plugged into an electric outlet. 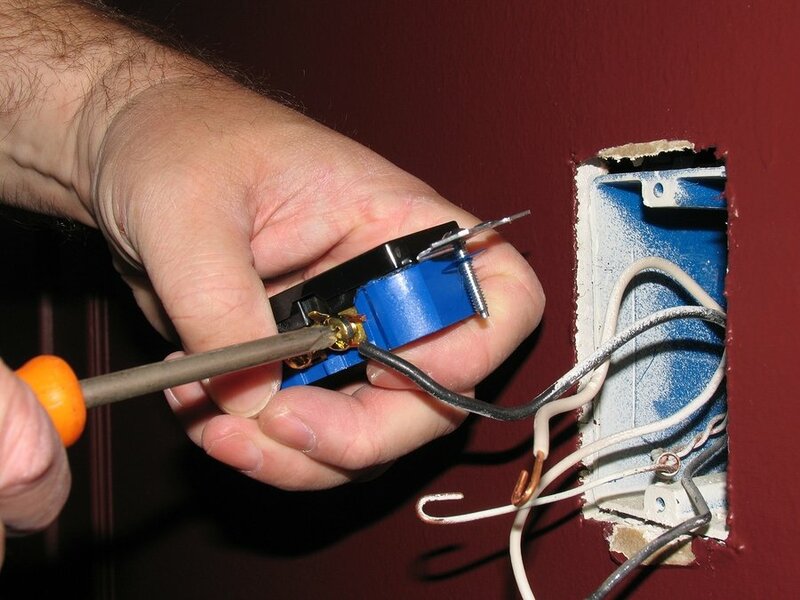 If you notice exposed wiring on an appliance or cable, get it replaced. And if the problem lies with a wire elsewhere in your home, get in contact with an emergency electrician. While not as common in Australia as they are in the States, there are still many older homes out there that feature old-fashioned knob and tube (also known as K&T) wiring. Popular around Federation, this type of wiring predates electrical insulation. Electricians would suspend wiring by weaving it through a series of ceramic knobs and tubes. This would maintain a gap between the wall and wiring, protecting homeowners from shocks. Needless to say, K&T is hopelessly out-of-date thanks to the invention of electrical insulation! And since uninsulated wires can be dangerous for anything that they come into contact with, the few homes that still use this type of wiring are at a higher risk of house fires and electrocution. Like we mentioned above, most modern homes feature Ground Fault Circuit Interrupters (GFCIs). These devices are like mini circuit breakers integrated into individual power sockets, especially sockets in bathrooms and kitchens. If your outlets are damaged or otherwise non-functional, you lack a key layer of protection against fire and overheating. A GFCI outlet that’s overly hot and failing to reset when tested should be replaced immediately. And if you’re still using outlets that don’t have GFCI devices in them, you need to get them replaced, ASAP! While this one isn’t directly tied to your electrical wiring, it is a common-enough problem that we see. Functioning smoke alarms should be a top priority, even if the rest of your home’s wiring is 100% safe. It should go without saying that dysfunctional and missing smoke alarms can put your home – and of course, your family – in a great danger. Check the functionality of your home’s smoke alarms every six months and regularly get the batteries replaced.Keep your family and home safe from any electrical hazards! Contact an emergency electrician in Melbourne today! These are some of the most common electrical problems electricians like us uncover during electrical inspections. Your home may suffer from one of them! Keep your home and family safe with the help of Briggs Electrical. As one of the leading electricians in south-east Melbourne and Bayside, we see (and fix) electrical problems like these all the time. Our team offers a wide range of electrical services, from regular services, to rewiring and emergency electrical work. Best of all, our qualified and licensed electricians are available 24/7! Contact our team today on 1300 300 222 or get in touch online to receive the best electrical services for your home today.